The garden is under snow—and after several crispy dry winters during our sustained drought, I’m not sorry about this fact. The snow isn’t deep, but there’s enough of it to cover the planting beds and protect them from the winter wind. With our coldest months of the year coming, I’m hoping the snow will linger, that however crusty and grainy and dirty it becomes, the blanket will hold until spring, when it can melt and treat the beds with an inaugural soaking. The 2013 edition of the garden was not what I would call a rousing success, although aspects of it get points for duration: I harvested three tomatoes on Christmas Eve, plucking them from the scraggly plant we’d moved into the greenhouse back in October. I finally dug my carrots on November 19, some of them odd-shaped lunkers with little roots sticking out the side, evidence of the neighbors they’d consumed whole when I fell behind in my thinning. The last of the potatoes came out of the ground the following week, in time for Thanksgiving. The soil was lumpy and cold but not yet frozen: lucky for me, but entirely on a par with the rest of 2013, which can only be described as a wild ride. What once was a trio was one…then none. Coming off a horribly dry 2012, January was parched, with less than an inch of snow. A scattering of storms from February through April brought a little precipitation, although not enough to reliably cover the powder-dry ground and certainly not enough to relieve the drought. Over the course of a few nights, a rodent ate the three ball cactus I’d transplanted next to the house years ago, flicking the spines off them one by one and then eating the flesh down to the root. In the piñon-juniper forests south of here, roughly a third of the trees were dead or dying. Ponderosas in our neighborhood were following suit, and the pasture looked like we were trying to grow dust—and succeeding. Dry summers had stunted the grass, and open winters, with no snow cover to protect the roots from sun, wind, and browsing, left nothing but brittle stubs that shattered when I walked across them. Sunset, June 20, 2013. Compare this view with the moon-set image in “Wraparound,” my previous post. Then June hit, with abrupt and scorching heat. The Royal Gorge and Black Forest fires started on June 11, both smoke plumes visible from our place. 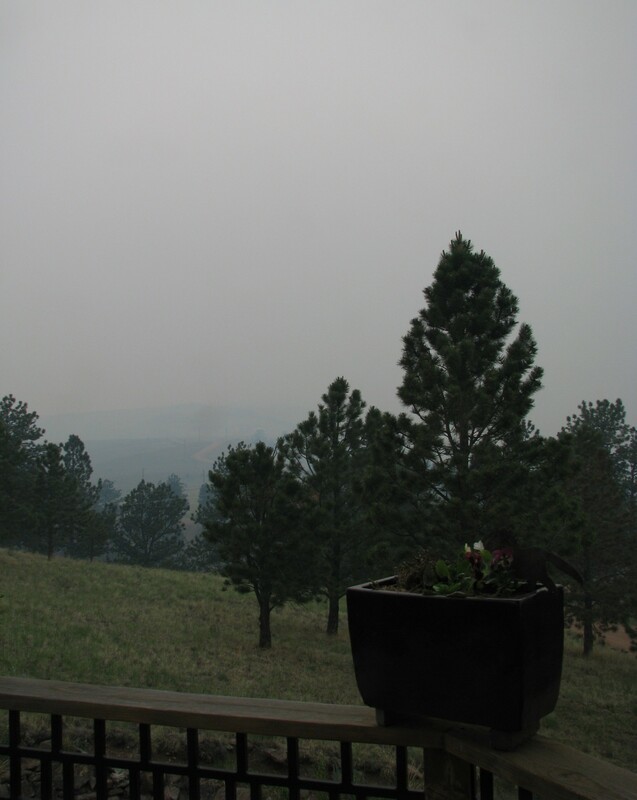 The following week, smoke from the East Fork Complex of fires on Wolf Creek Pass, almost a hundred fifty miles southwest of here, closed in around us, so thick we had to hunker down with windows closed in spite of the swelter. We usually get at least one hailstorm each summer, but they tend to be quick-moving and the hailstones are small: our location in the mountains puts us at the front edge of storm formation. Once they hit here, I can watch the black clouds drag their heavy gray curtains across High Park, headed for the foothills around Pikes Peak and then points east, knowing that pea-sized ice is getting bigger and bigger. Although small, the hail can do some damage, and when several inches of the stuff pounded down one Saturday night in mid-July, I was resigned to be grateful for the moisture and let the garden fight its way back if it could. Three more times, just as shoots were beginning to rise from the mash, another hailstorm hit. These storms didn’t drop as much ice as the first one, but instead of the uniform peas we usually get, the hailstones ranged in size from BBs to the diameter of a quarter: the biggest I’ve seen up here…so far. One storm stripped the entire crop off the cherry tree, leaving it ringed with pale pink pulp. The early September rain event that flooded Boulder and other communities farther north brought us three inches of decent moisture over the course of five days. The garden had come back to a certain extent—the determination of living things and all—but was hardly a picture of lushness. Kale, a cool-season plant that normally flourishes in my garden, had flat-out refused to grow. The beets, which typically provide a twofer of bumper crops—greens as well as beetroot—just weren’t interested; I thinned out a few small nuggets over the summer and then harvested more of the same in October. A scattering of spinach put out leaves that never grew beyond baby size. The squash plants added a few half-hearted leaves but never got much bigger than bedding plant stature. I picked one crooked mini zucchini that offered more in humor value than it did edible substance. I harvested a lot of onions, but half weren’t much bigger than a pearl variety. The crops that did manage to rally did so too late. Our first hard frost didn’t arrive until almost the middle of October, late for our elevation, but the tomatillos and green beans were just starting to yield. The root crops limped along. I was skeptical of any success for their efforts, and was surprised when I ended up with six pounds of carrots. Outside the garden wall, the potato patch had actually grown pretty nicely, but I hadn’t found much when I grubbed around for new potatoes during the summer and wasn’t optimistic. The early plague of pocket gophers all but vanished when the rain began, though, and the moles hadn’t riddled the beds with tunnels, so when I started digging in October, I came away with about twenty-five pounds. The belated second round of digging just before Thanksgiving yielded almost as much, most of them a lovely purple variety. Mashed, they weren’t only tasty, but helped our holiday meal set a new standard for vivid color. Late harvest tomatoes, with hail scars. And now, those tomatoes. The main stem of the plant had been smashed back in July, but I left a surviving side shoot to see what it could make of itself. When we loaded the pot onto the dolly to roll it into the greenhouse in October, there was one ping-pong-ball sized fruit and a couple of green marbles dangling off the leggy and lopsided plant. They held on for the trip, and spent November and most of December growing at a leisurely pace in their awkward spot off the side of the pot, until I picked them on the day before Christmas. They’ve been ripening near a sunny window, and now, in these young days of the new year, we’ll decorate our salads with them. The flesh is meaty and firm. What the tomatoes lack in sun-warmed intensity, they more than make up for in promise: for a new year, for a new season of growing, for the determination of living things. This entry was posted in gardening, weather and tagged wildfire. Bookmark the permalink.